Find your heart line (starts at the edge of the palm at the pinky finger and ends at the middle or fore-finger)...Where does it end? Is your heart line curved or straight ? Which of the following are true about your heart line? Is your heart line broken anywhere? Is your heart line chained? Do you see any squares on the heart line? Are there any vertical lines that intersect the heart line? Compared to your middle finger...is your ring finger long or short? The characteristics of your heart line show that you are a ruthless, self-centred and narrow-minded when it comes to love. You have a tendency to be lonely and will often unknowingly push people away. The characteristics of your heart line show that you are a loyal and devoted lover, however; that may come as a fault...as you are also destined for heart-ache down the road. The characteristics of your heart line indicate that you expect perfect from your relationships. You have immense dreams for you live life and expect them to come true! Are you destined for a long and full-filling love life? Or will you be sitting home, alone with cats for the rest of your life? Palm reading goes back to ancient China and can actually tell a lot about a person's future. 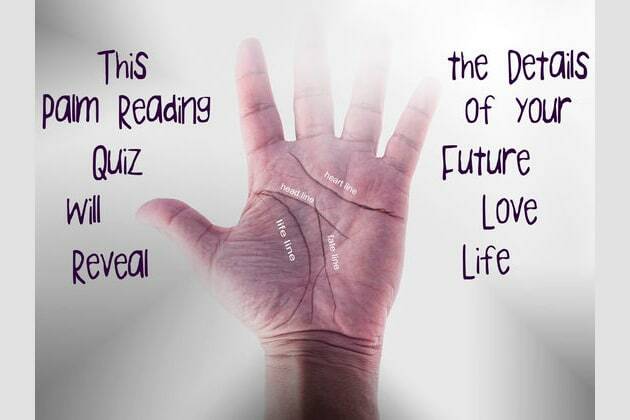 Take this palm reading quiz to find out the details of your future love life.